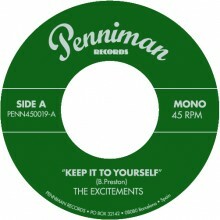 After some sessions late 2012 - early 2013, The Excitements released it's new 45 as taste of what was cooking later that same year: the release of their second LP. And no better way of doing it than presenting the opening song of their album, Billy Preston's "Keep it to yourself", arranged and driven in an ultra fast and tight gospel-tingled way, all the way from the church into the bandstand! Side B is the band's first original making it’s way to vinyl, a soulful mid-tempo ballad with lyrics aiming to heal a broken heart, and urging to get back what was taken away in order to feel in peace. As it's Penniman's usual policy, you'll only get your hands on this song if you buy this very piece of wax.